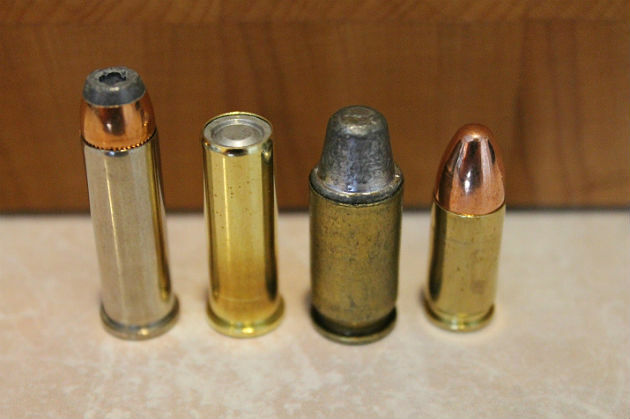 A .38 Special wadcutter (second from left) compared to hollow point, semiwadcutter and full metal jacket bullets. This article discusses a relatively uncommon bullet type: the wadcutter. Though the wadcutter is not extremely rare, it is still a relatively specialized bullet type that is only utilized in a few different cartridges. Like most highly specialized bullets, the wadcutter is great at the job it was designed for: competitive shooting. However, it struggles in applications outside of its primary use. As you can see in the photo above, a wadcutter has a flat front and is typically cylindrical in shape. Additionally, the bullet is usually all lead and has no jacket. Wadcutters are commonly (though not always) loaded so that the bullet is completely encased in the case. Some wadcutters have a flat base, but bullets with a hollow base are probably more common. The flat shape of the nose is the primary feature of the wadcutter. Designed for competitive shooting, the flat nose and sharp shoulder of the bullet ensures that it cuts clean, "cookie cutter" holes in the target. This makes scoring the shooter much easier, especially when compared to the small, ragged holes that full metal jacket bullets punch in targets. As you can see in the photo below, there is a dramatic difference in the size and shape of the holes that wadcutters make in a paper target compared to a regular, round-nosed, full metal jacket round. Wadcutter bullets are almost always unjacketed and made of lead. Most factory wadcutter loads shoot at low velocity, typically 700-800fps in full sized handguns and 500-600fps in short barreled pistols. The low velocity of these rounds significantly reduces their recoil. This, combined with their generally excellent accuracy at short to moderate range, makes the wadcutter an ideal choice for people learning how to shoot. Unfortunately, the shape of the bullet combined with the extreme low velocity of the round also decreases the effectiveness of wadcutters when used for self-defense. Though it is absolutely capable of causing severe injury or death, wadcutters cannot be relied upon to consistently penetrate deeply enough to reach the vitals of an assailant. I've read about hand-loaders taking hollow-base wadcutter bullets and seating them upside down for use as self-defense ammunition, but results were often erratic. As a result, wadcutter bullets should only be used for self-defense purposes if there is nothing else available. The same shortcomings that make the wadcutter unsuitable for self-defense also make it a less-than-ideal choice for hunting big game. Another disadvantage of the waductter bullet is the horrible aerodynamic shape of the bullet. This restricts the use of wadcutters to relatively close range (<50 yards). Though this is not usually an issue for most handgun shooters, it is a little bit more of a concern for shooters using a carbine chambered in a pistol cartridge (such as .357 or .44 Magnum). Additionally, wadcutters are difficult to quickly load due to the blunt, un-tapered shape of the bullet. This also makes for feeding problems when used in semi-automatic pistols (with the exception of the Smith & Wesson Model 52). As a result, full wadcutter bullets are almost always used in revolvers, with .38 Special being the most common caliber. Though full wadcutter bullets are often unreliable in semi-automatic pistols, semi-wadcutter bullets usually work much better. As you can see in the photo above, the .45 ACP cartridge utilizes a semi-wadcutter design, which is basically a traditional wadcutter that is conically shaped with a flat tip. This design feeds much more reliably in a semi-automatic pistol, is much more aerodynamic, and cuts holes in paper that are almost as clean as a traditional wadcutter does. Semi-wadcutters generally have a shorter bearing surface than traditional wadcutters. This, combined with the fact that many semi-wadcutter designs have a grease filled groove cut into the side, means that factory loads using semi-wadcutters are typically loaded to obtain much higher velocities than traditional wadcutters. Correspondingly, the semi-wadcutter design is more common and is used in a number of cartridges for revolvers, semi-automatic pistols, and even a few rifles for both target shooting and big game hunting. 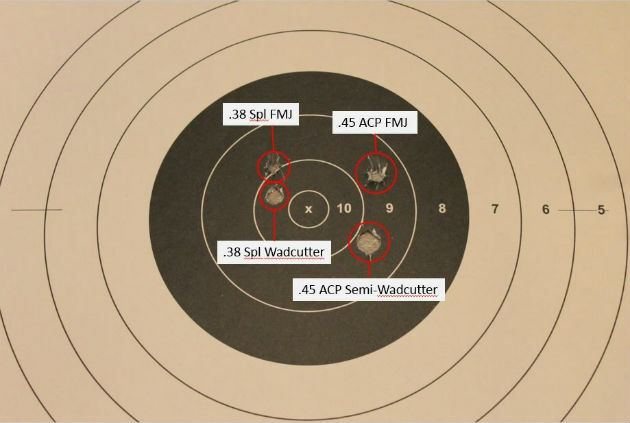 Even taking into account the below average performance of the wadcutter in hunting and self-defense situations, it is still a pretty useful bullet for target shooting and training new shooters. Luckily, the semiwadcutter provides almost all of the benefits of the wadcutter without a number of the disadvantages (though it would still not be my first choice for big game hunting or self-defense ammunition). If you own a revolver, especially one chambered in .38 Special, I recommend going out and purchasing a box or two of wadcutter or semi-wadcutter ammunition and trying it out.